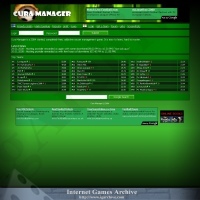 Cura Manager is easy to learn but hard to master kind of game. You can always choose and succeed with good formation and tactics, but when your opponent starts demolishing your stadium and beating your players, counter Measures are needed.It's relatively easy to develope your team from the scratch. Buy or loan better players, hit the training camps or even give some questionable nutrients.Register today and see if you have what it takes to be a true Cura Manager.